One stop shopping for Bees, Classes, Equipment, Honey, & more! Click here to buy NUCS, HONEY, & MORE! 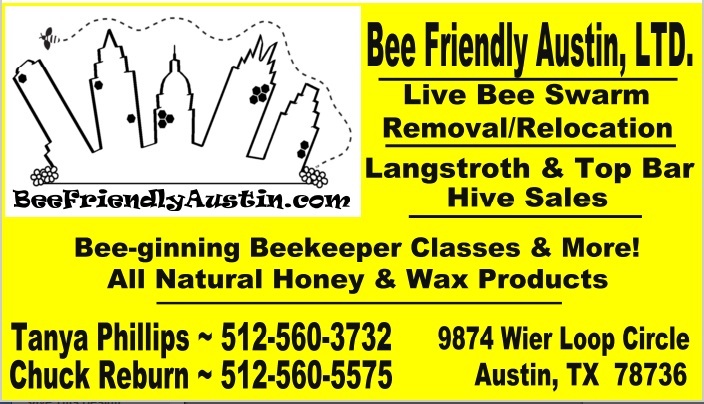 Bee Friendly Austin began as a simple backyard apiary in 2013, and quickly grew into our full-time passion as we gained knowledge and experience with bees and beekeepers in Central Texas. Our goal is to provide the best education, the highest quality equipment, and superior, mite resistant, bee stock to help create a strong foundation as you embark on your own journey into beekeeping. With successful tools, you can enjoy your newfound passion, your bees will thrive, and together we will save the world, one bee at a time! Classes start up again in February! Now taking orders for 2018 Spring Nucs. 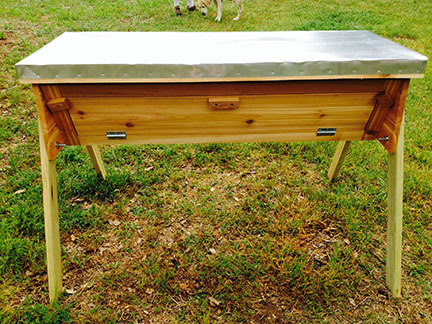 We sell langstroth nucs or full colonies and a limited number of top bar nucs. Reserve now for April/May pick up. Tanya's bee 101 class is wonderful, she is a fun teacher that will give you the confidence to be a beekeeper! 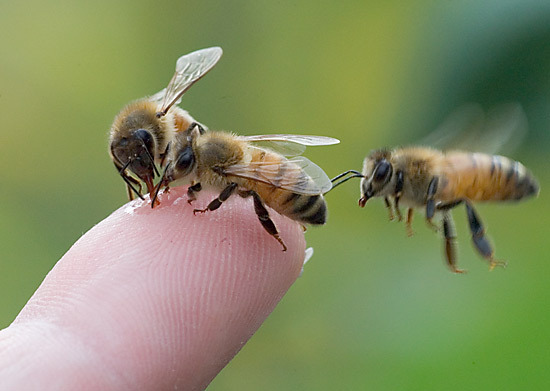 I would highly recommend Bee Friendly as a great place to learn about beekeeping! 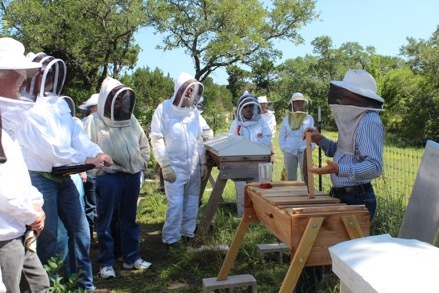 They are founders for the Central Texas Tour de Hives where folks can tour different bee yards between Georgetown and Dripping Springs. Tanya and her husband Chuck are small-scale beekeepers and own Bee Friendly Austin, a small Certified Naturally Grown Apiary in Southwest Austin. Tanya tends the Top Bar Hives and teaches beginner and hands-on beekeeping classes, while Chuck works with the Langstroth Hives and also builds beehives from beautiful milled cedar. The Tour de Hives has helped thousands of visitors learn about the amazing honey bee and see how beekeepers keep bees in their own backyards. The tour date coincides with National Honey Bee Day, the 3rd Saturday in August and is a fun family event. 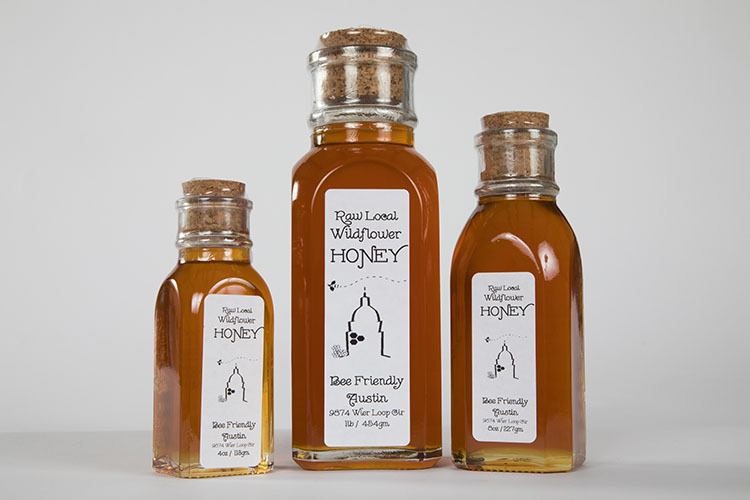 Apiary Tours and Raw Texas Honey for Sale!!!! If you want to come by for an APIARY TOUR, please check our OPEN HOUSE schedule. We are a working apiary and almost every day is a work day for us, so we may not be onsite if you just show up.